Most speculators find it difficult to have lasting success when dealing on financial markets. The reasons are complex and multi-faceted, but most professional traders agree that the primary problem is not the technical requirements or the financial markets themselves but the human psyche. Fear of loss, greed, insecurity and indecisiveness are some of the entirely understandable feelings that often stand in the way of profits. In addition, there are the practical problems such a lack of time, missing information and insufficient or even non-existing analytical tools. Admittedly, the task is not simple. Numerous market factors constantly influence price movements. Publication of market data, political statements, or unexpected news can switch the direction of price within seconds and completely wipe out a day’s trends. It is that much more important to keep a cool head and to then take stock of your own requirements and objectives. The top priority in doing so is given to the selection of your financial instruments and thus deciding between long-term, lower risk, but also lower return investments and trading on a fast-moving market with a high level of risk and also higher possible returns. “I think the speculator is the intellectual trader, who trades deliberately, who attempts to correctly predict developments in the economy, politics and society and who attempts to profit from those predictions." 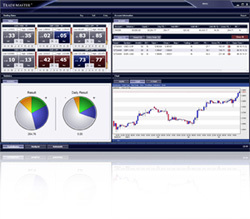 … exchange trading has been revolutionized and redefined! Perfect, safe trading around the clock, with differentiated analytical methods, completely automated master strategies from trading experts and constant complete control for traders.